In this paper, we study the impact of energy taxes and the EU ETS on a large number of firms in Europe between 1996 and 2007. Using company level micro-data, we examine how firms in different sectors were affected by environmental policies. Aspects of behavior and performance studied include total factor productivity, employment levels, investment behavior and profitability. On the whole, energy taxes increased total factor productivity and returns to capital but decreased employment, with a mixed effect on investment, for the sectors included in our analysis. However, large sectoral variation is observed, with some industries losing out in terms of productivity and profitability when faced with increased energy taxes, while others benefitted. Proceedings - Electrification, productivity growth and firm heterogeneity. 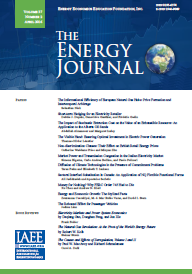 Published in Volume 32, Number 4 of The Quarterly Journal of the IAEE's Energy Economics Education Foundation.